A suspected stalker who police say continuously texted her alleged victim for months was arrested Tuesday, a month after allegedly breaking into his Arizona house and being found in his bath. 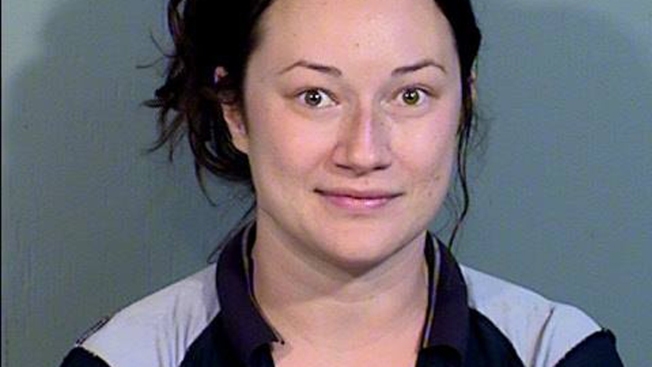 Jacqueline Ades, 31, was arrested for a first time in April when a resident of Paradise Valley, Arizona, called police to say he saw her on his home surveillance system. The resident knew Ades — he first reported her to police in July for allegedly continuously texting him even though he no longer wanted contact with her, according to a news release from the Paradise Valley Police Department. Ades allegedly sent the victim 65,000 text messages, including one that said, "Oh what would I do w ur blood! I'd wanna bathe in it," NBC affiliate KPNX reported. Ades was again arrested on Tuesday and booked on stalking, threatening and harassment charges as well as a warrant for failing to appear at a court date connected to the April trespassing incident. NBC reached out to the Maricopa County public defenders office for comment on Ades' behalf. Ades was first reported to police in July, when they found her parked outside the home in the Phoenix suburbs, police said. Soon after the incident, she allegedly began sending threatening texts to the Paradise Valley man. She was reported at the residence in December but police didn't find her there, according to police. The victim was out of the country when she allegedly broke into his house on April 8, but he saw her through home surveillance video and called police, according to the release. Officers found her taking a bath and arrested her; she was charged with trespassing and released, but allegedly continued to text the victim threatening messages. Ades was found last week outside the victim's business in nearby Scottsdale claiming to be his wife and removed by that city's police. When Paradise Valley police found out about the incident, officers searched for her and took her into custody without incident.